Click on most images to see larger versions. 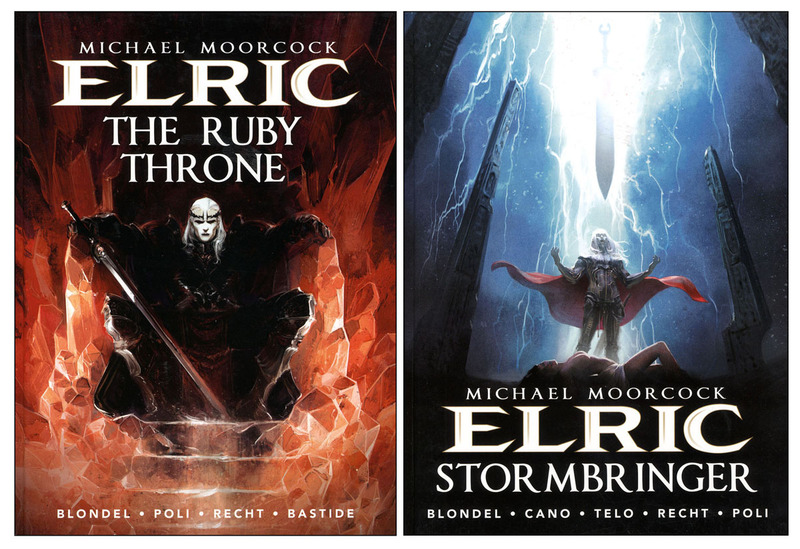 Stormbringer is the second volume in a new series of French comic albums—or graphic novels or romans graphiques—adapting Michael Moorcock‘s Elric prose fantasy saga. 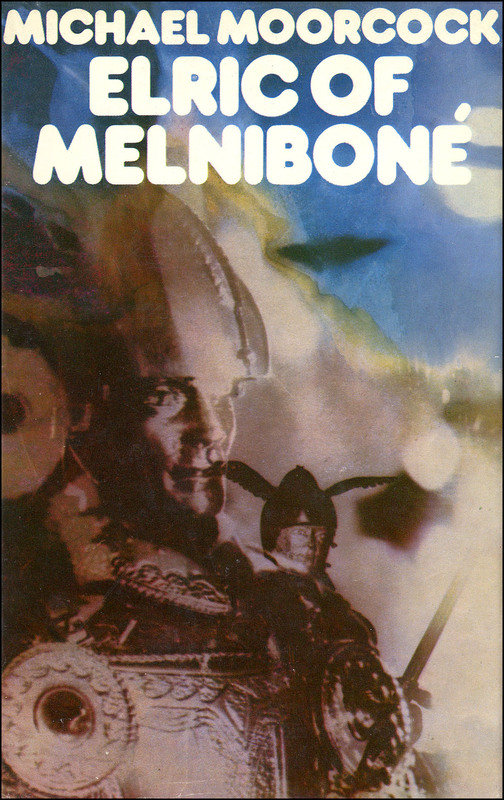 It is the second of two volumes reworking the 1972 book Elric of Melniboné. The first was The Ruby Throne (Le Trône de Rubis) which I have written about previously, and found very impressive. (Previous post.) Titan has published English-language versions of both books. Compared to Robert E. Howard or Arthur Conan Doyle, for example, there have been relatively few adaptations of Moorcock’s stories by other hands over the years—some more faithful to the originals and some less so. As Alan Moore points out in his introduction to this book, most of them have been in the comics medium. Far more numerous than adaptations have been the outright rip-offs. In a career reaching back the late 1950s, one of Moorcock’s many notable contributions to fiction—his own and other people’s—has been The Multiverse, that near-infinite series of nested or fractal parallel worlds. In the Multiverse, the same story might play out a number of times, with more or less variation, depending on how close together the realities in question are in the shifting structures of space and time. Faced with another book, comic or game with concepts or storylines blatantly stolen from Moorcock, followers of his oeuvre must learn to say tolerantly to themselves, “There is room in the Multiverse for many, many stories.” The alternative is a life spent in a downward spiral of anger, hatred and despair. Or at least, frequent afternoons slightly spoiled by recurrent episodes of righteous indignation. 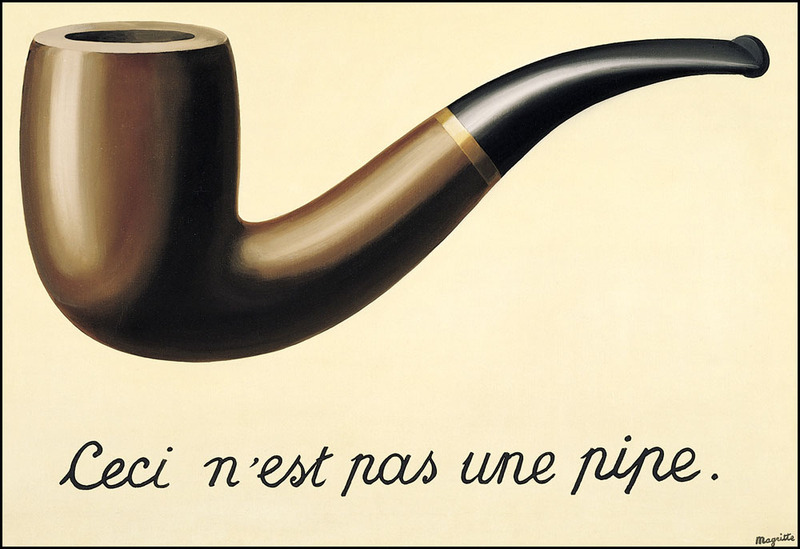 Likewise, when exposed to a less-than-authentic adaptation of a Moorcock, we might simply remark, “That obviously happened on another plane of the Multiverse,” and get on with our lives. This was how my younger self responded to Robert Fuest’s 1973 film version of The Final Programme, Moorcock’s first Jerry Cornelius novel. I thought the end was utterly messed up, but found enough to like about rest of the film that I was prepared, on the whole, to forgive Fuest his trespasses. Over the years, as I came to a fuller understanding of the Cornelius series—that’s fuller, as opposed to full—my opinion of the film swung strongly to the negative. Fuest had, I felt, betrayed the serious purpose of Moorcock’s work, trivialising and even reversing some of its thematic content. I discussed the parallels between early Elric, Jerry and the young Michael Moorcock when reviewing The Ruby Throne. That handsome hardback covered approximately the first third of the book Elric of Melniboné. The 1972 novel itself was a prequel to the original cycle of Elric stories from a few years earlier, filling in background material and providing, essentially, an Origin Story for the doomed albino. Further prequels, and some more, er… Multiversal… stories followed. (In the Multiverse, things don’t always happen before or after other things.) The entirety of Elric’s adventures now fills a good many more pages than the three slim paperbacks he had accrued by 1972. 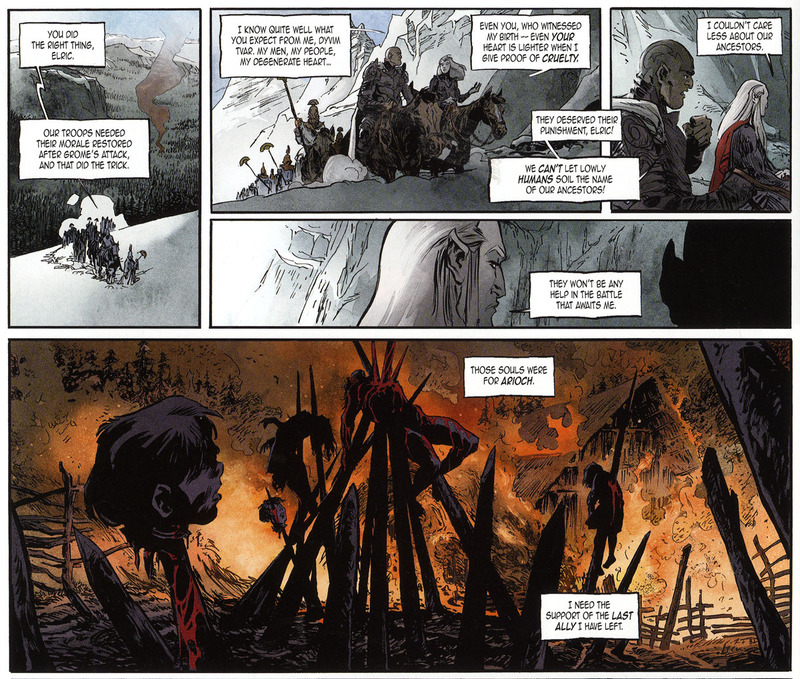 Glénat’s graphic novel series plans to tell a version of the saga in four albums. In The Ruby Throne, broadly following the plot of Elric of Melniboné, Elric’s cousin Yyrkoon fails to kill Elric and to usurp him as Emperor of Melniboné. Yyrkoon has however kidnapped Elric’s lover, Cymoril, and disappeared with her to seek further revenge. 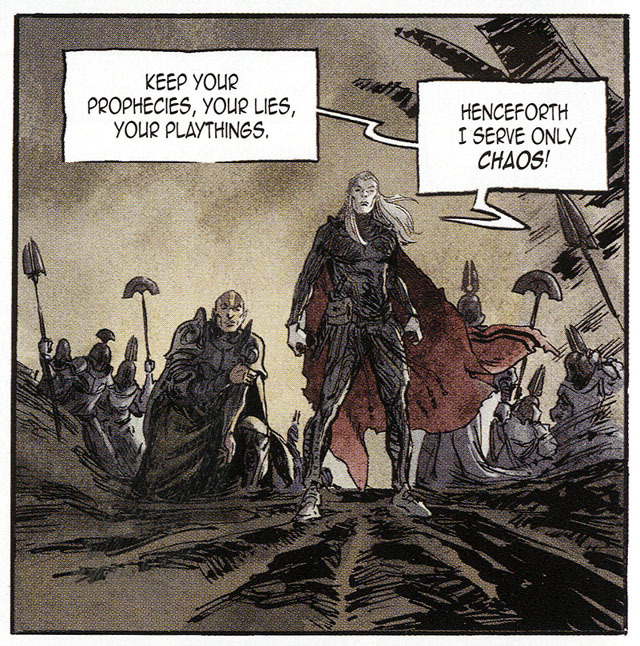 In desperation, Elric calls on a powerful supernatural entity, Lord Arioch of Chaos, for help. 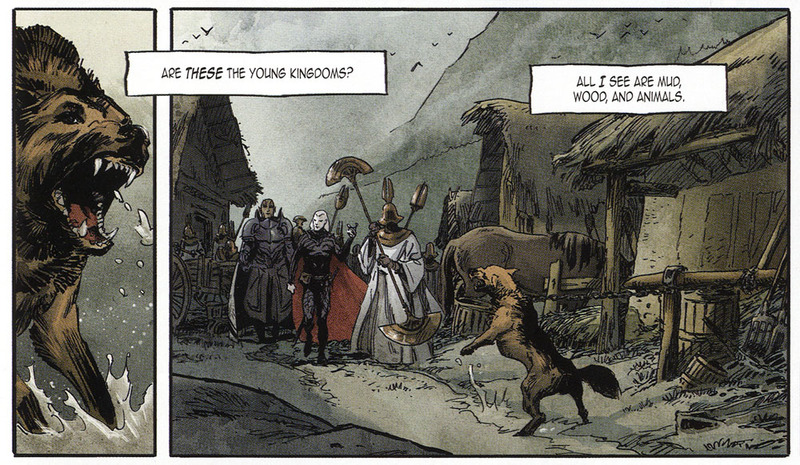 In Moorcock’s original story, Arioch reveals to Elric that Yyrkoon is seeking two ancient and hugely powerful magic swords. 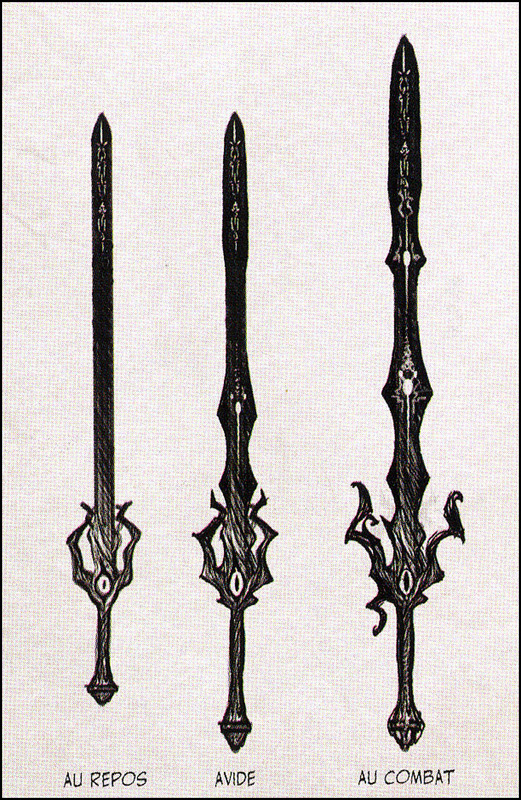 These Chaos-blades will give Yyrkoon mastery over Melniboné and the world. Elric has little choice but to swear loyalty to Arioch in return for help in chasing down his cousin. As with Faust, this bargain with a demonic power is of course very important to the entire saga. Furthermore, Elric will have to wield one of those swords himself, risking its ancient evil curse. I (and many others) noted several differences between The Ruby Throne and Moorcock’s original story. Those changes seemed to most commentators to strengthen the narrative. There were a couple of things which I thought were mistakes, but on the whole—like Moorcock himself—I liked The Ruby Throne very much, and looked forward to the next instalment. Now it’s here, rather unfortunately called Stormbringer. Moorcock’s original novel of that name was the grand finale of Elric’s saga, its ultimate end point. Elric of Melniboné was the saga’s beginning. Anyone expecting this graphic album to be an adaptation of Moorcock’s Stormbringer will be particularly baffled. This kind of confusion haunts the Elric series. Elric of Melniboné was originally published in the USA as The Dreaming City. 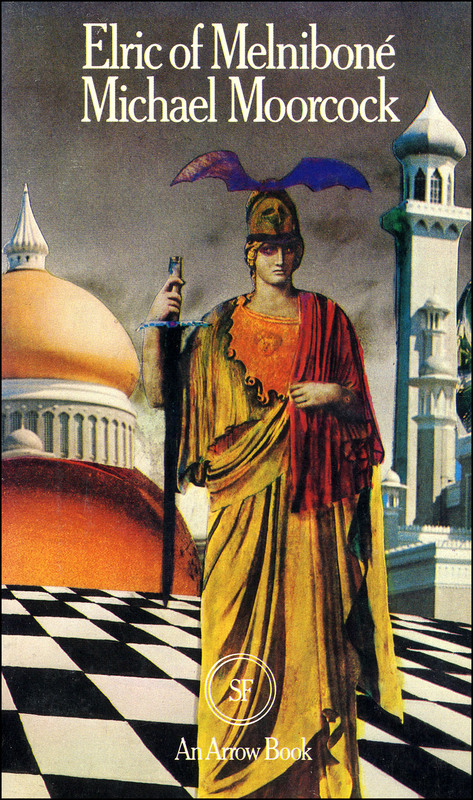 Moorcock’s own The Dreaming City was the short story which kicked off the whole saga in 1961. So it goes. Elric of Melniboné has a substantial middle section, in which Elric bargains with the King of the Seas for a magical ship, sails to the edge of the world with a small army chasing Yyrkoon, defeats his cousin’s forces in battle, and finds Cymoril. His evil cousin escapes into another dimension. In the final third of the book, Elric follows the escaped Yyrkoon, and meets a new ally, Rackhir the Red Archer. With Rackhir’s help, Elric is able to fight off an attack by demons, and track Yyrkoon to the mystical, womb-like cavern where the great twin black swords are hidden away—supposedly beyond any further use, but in fact waiting to be reborn into the world. Elric has been manipulated by Arioch into taking up Stormbringer, one of the cursed swords, in order to stop Yyrkoon. Thinking himself master of the sword, which feeds strength to his feeble albino body, Elric little realises that he has saddled himself with a treacherous and addictive ally which may yet deliver the world into the hands of the Lords of Chaos forever. For this new graphic adaptation, original writer Julien Blondel is joined by co-scripter Jean-Luc Cano. They shorten the narrative considerably. As with many changes in the previous volume, this makes a certain amount of sense. Arguably, the main thrust of this tale lies in establishing what Stormbringer is, getting the sword into Elric’s hands, and exploring the implications for the albino of wielding this most two-edged of weapons. In an adaptation intended to lead on to further instalments of a lengthy saga, there is an obvious temptation to move the story forward at a faster pace. Compressing the middle parts considerably could potentially work out well. To some extent the changes made here are inoffensive, and as with The Ruby Throne, some could be seen as improvements. The end of Elric’s confrontation with earth deity Lord Grome, for example, did not seem entirely credible to me in the original. Sadly in this new version it simply peters out, which is no real improvement. Also, the visual storytelling in this sequence is less than clear. I had to stop and re-read it to figure out what was going on. This does not help narrative flow. Unfortunately, the writers have gone far beyond that, and changed the storyline in ways which in my view move too far away from the essence of Michael Moorcock’s Elric. What is that essence, and why does it matter? In the prose books, Elric is the youthful emperor of an ancient Empire which has been in decline for generations. The island nation of Melniboné formerly ruled most of the known world, using military might, dragons which rained fire from the skies, and superiority in magic—this world’s equivalent of science. As I have said before, the allegorical or metaphorical relationship between Melniboné and especially Britain, but also any other post-WW2 nation with an imperial past—France, for example—was not far beneath the surface of the Elric stories. Similarly, Moorcock himself was not unaware that in Elric he was in part writing the disguised autobiography of an alienated young man. In Elric’s world, the Young Kingdoms are no longer directly under Melniboné’s yoke, but still largely dependent on her for trade, and jealous of her remaining wealth. Melnibonéans were cruel and ruthless as rulers of the world, and as the sun sets on their empire, they remain contemptuous of the Young Kingdoms. Melniboné itself has sunk into a state of decadence. Its leaders understand that a terminal decline seems inevitable, though some believe that Melniboné could rule the world again if it embraced its true destiny. 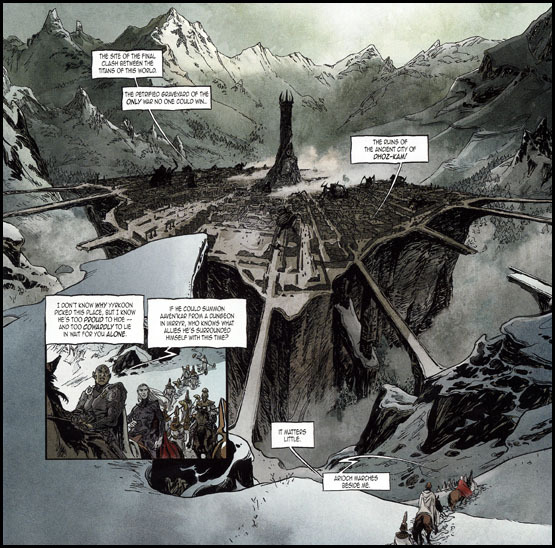 Elric, as written by Moorcock, represents a new strand in Melnibonéan thinking. As a physically weak, somewhat isolated albino, he has grown up with a taste for scholarship. He has come to believe that Melniboné must learn lessons from the Young Kingdoms, and find new ways to co-exist peacefully with them. He thinks Melniboné can only survive, indeed thrive, by sharing around its ancient wisdom. In this Elric is pretty much alone amongst his countrymen. But since he is, after all, their emperor, he hopes to carry the nation with him somehow and see his vision fulfilled. Throughout the series, the reader is led to understand, and then to witness, how Elric is doomed by a terrible destiny, one written for him by the Fates millennia ago. But this mystical species of destiny, like the classical Greek version, or the Saxon notion of wyrd—now a familiar trope of fantasy fiction—is mirrored by a personal doom more grounded in Elric’s own ideology. This is typical of the Romantic strand of Moorcock’s fiction, in which the environment, for example (be it your basic miserable rainy day, or a nightmare landscape mystically transformed into a boiling morass of pure Chaos) might reflect the psychological state of the protagonist. So too, in that “as above, so below” or fractal kind of way in which The Multiverse functions, is Elric’s Terrible Mystical Destiny a reflection of something a modern reader can perhaps relate to more directly—his ill-fated idealism. For Elric can surely never succeed in steering Melniboné towards the kinder, gentler future that he wants for his nation. He is perhaps doomed to fail not only by the adverse characteristics of Melniboné itself, but by his own nature as a Melnibonéan. In the original Elric story cycle, published in 1961 to 1964, these issues were mainly, perhaps entirely, under the surface of the text. 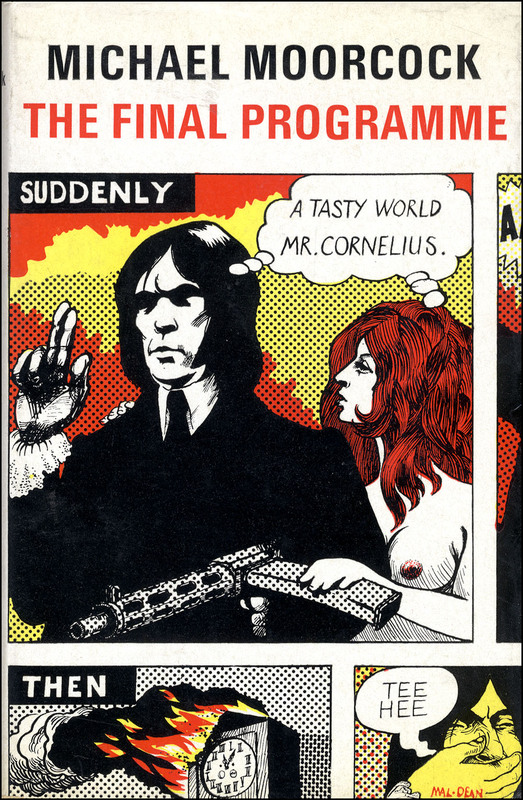 A few years prior to 1972, when the prequel Elric of Melniboné appeared, Moorcock had rewritten the early Elric stories into the contemporary 1960s narrative of The Final Programme, with Elric transformed into Jerry Cornelius. In Jerry, the relevance of 20th century idealism, of rebelling against the society that you grew up in, was a good deal more obvious than it had been thus far in Elric. In Elric of Melniboné his author undoubtedly sought to bring Elric’s youthful idealism more to the fore. At the same time he is shown to be steeped in Melnibonéan culture. His differences from the modern reader’s sensibilities are underlined, for example, in the scene where he is required by protocol to watch his official torturer, Dr Jest, deal very nastily with some Young Kingdom spies. Dr Jest enjoys his work. As written by Moorcock, Elric does not enjoy watching it, but neither is he disturbed or disgusted by the spectacle. He is merely bored; he has better things to do. This scene also occurs in The Ruby Throne. It is amplified and in some ways improved by Dr Jest and his tortures being shown as not only horrendous, but also weirdly magical. At the same time, the scene’s value in telling us something about Elric’s character is diminished, because we are not shown how he feels about it. As seen above, Elric in this version might also be taking power from the souls of the slain—or this may be a dark jest. In Moorcock’s original, Elric gains energy not from blood, but from concoctions of herbs and other drugs. 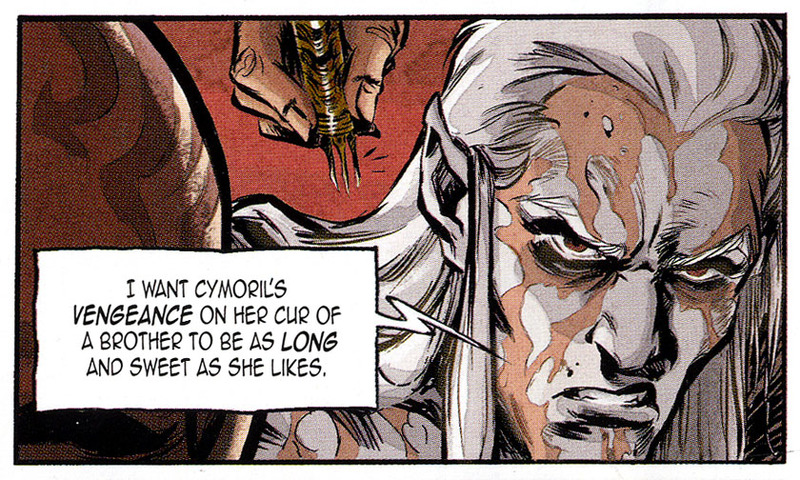 The introduction of this scene in the graphic novel not only gives Cymoril a more substantial role, but underlines what decadent, arguably evil, Melnibonéans both of them are. 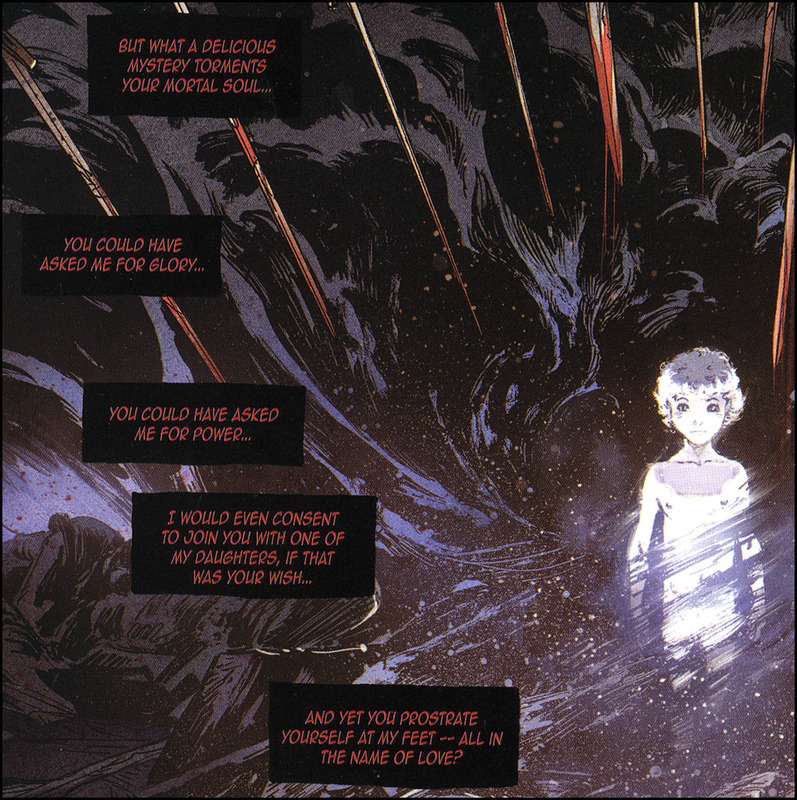 Elric’s greed and insouciance in the face of this multiple murder can be seen as a strong point in the adaptation, an advance on Moorcock’s attempts to make similar points. In the original book, for example, human slaves have been surgically altered so they can sing only one pure note, and a choir of such slaves makes music for the court. In the medium of the graphic album, the bathing-in-blood scene can rightly claim to be a visually more powerful statement of a similar idea. It is also more directly relevant to Elric personally than the choir. But looked at from another perspective, this scene rings warning bells regarding this creative team’s understanding of their main character. Elric has gone from Moorcock’s vegetarian stance, magically speaking, beyond meat-eating directly to vampirism and soul-stealing. 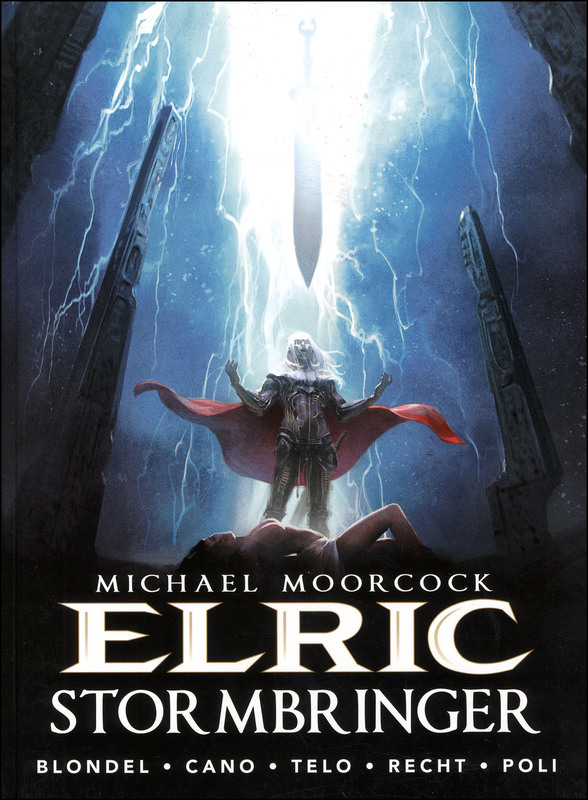 This might be all well and good, making a more powerful statement than in Moorcock’s book etc., except for one very important factor—Elric is supposed to become a vampire when he takes up the soul-drinking sword Stormbringer. If he is effectively already one before accepting the sword, the thematic thrust of the entire storyline is weakened. Elric’s compromise when he makes his Faustian pact and accepts Arioch’s logic—agreeing to gain a new source of strength from Stormbringer’s magic—is a major part of his wyrd. He has taken up a weapon of Chaos, fuelled by killing and the stealing of souls, in order to fight Chaos. Destiny-wise, it sets him on the path which will lead not only to the end of his world, but also to his own role in making the best of that bad situation. To the extent that Elric is an allegory for the modern idealist, he has now taken up The Man’s weapons to fight The Man. He has become an urban guerrilla with a gun and some explosives—Jerry Cornelius in whiteface. Moorcock’s story takes Elric from vegetarian to vampire. The graphic novel takes him from Countess Bathory to Count Dracula. The step is hardly of the same magnitude or significance. Amongst its undoubtedly excellent qualities, The Ruby Throne made a few mistakes of this kind. Stormbringer, though again a powerful and well-constructed book for the most part, compounds and intensifies this kind of error. Not wanting to go into great detail, I will say just three things about the storyline. Firstly, major narrative liberties are taken, understandably enough, to shorten Elric’s road to his first encounter with Stormbringer—to “cut to the chase.” Some of what the authors have done is certainly quite clever, excising non-essential elements like the Mirror Of Memory to speed up the story. But in some ways, as an adaptation of Elric of Melniboné, this rush to the finish weakens the work. 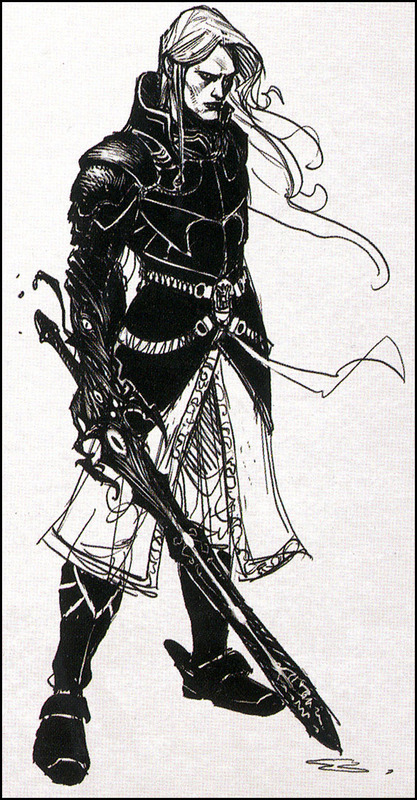 The absence from this version of Rackhir, one of Elric’s few friends and a future ally, is particularly noteworthy. Secondly, the end of the story and the nature of Elric’s bargain with Arioch are both altered considerably. Again, the authors might argue that they have crafted something here which is easier to grasp than Moorcock’s more ambiguous version, or seems more logical to them. But it is very different from the original and to me feels misguided. In Elric of Melniboné, Elric decides to wander the Young Kingdoms for a year, to learn about their cultures and prepare for his transformation of Melniboné. He leaves Yyrkoon—the next in line to the throne—in charge, as his regent, as tradition demands. Elric trusts that his cousin has been so soundly defeated that he will now accept his duty as a Melnibonéan royal. If Elric really thinks he is going to return to the throne in twelve months, welcomed back by a dutiful Yyrkoon, he is very naïve. If this is actually a way of abdicating his throne and his responsibilities, without acknowledging even to himself that that is what he is doing… well, either way, it’s a major step, and it is his own decision. In Blondel and Cano’s Stormbringer his exile from Melniboné is of a very different nature. I don’t want to spoil the story for anyone who might soon read it, and I know from the reviews that many have found it compelling and excellent. 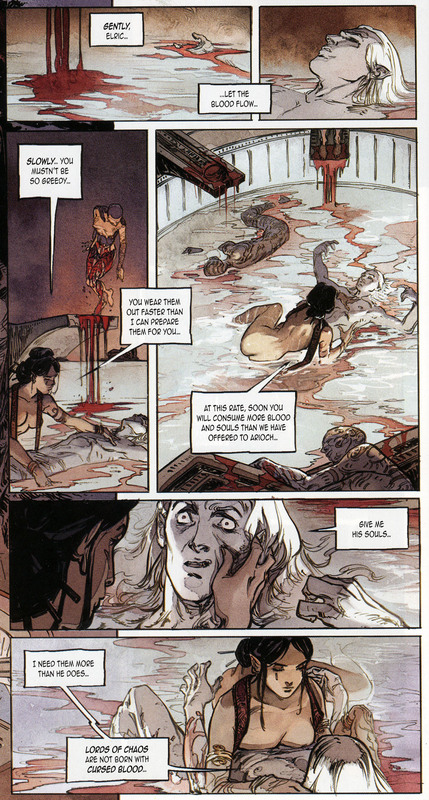 But I will say this: in the graphic novel, Elric is forced into exile by a second bargain with the demonic Arioch. 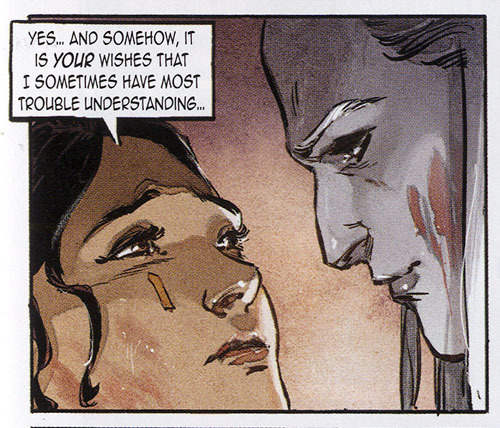 This in turn relates to his love for Cymoril, which has pretty much taken the place of his idealism in the narrative. This love is the driving force behind his bargain with Arioch in the first place, which is largely true to the Moorcock version. But it is possible to read the Blondel/Cano version and get the impression that it is only Elric’s capacity selflessly to love another Melnibonéan which separates him from his countrymen. The fact that he is also a man who wants to change his world for the better—and believes he has been granted the power to do so—has fallen by the wayside. To me, this is enough to fatally wound the narrative as an adaptation of Moorcock’s book. In fact there is actually a scene in Stormbringer in which Elric realises that The Young Kingdoms are utterly worthless to him and his kind. “What is there [here] even worth desiring…” he asks his lady love, in his head, “…except you?” Again, this might be seen as a powerful realisation in light of the fact that he is soon to be exiled there, without his beloved. But it also, yet again, removes one of the factors which in Moorcock’s version motivates this young idealist—his regard for the Young Kingdoms. By the end, when the full implications of his second bargain with Arioch are made clear, I had already lost faith in this version, due to another occurrence in this earlier part of in the story. This is my third complaint. Travelling the Young Kingdoms, heading for the confrontation with Yyrkoon, not yet in possession of the runesword, Elric is put up overnight with his soldiers in a village of humans. In order to prove to his men that he is a true Melnibonéan commander, and to strengthen his bond with Arioch (who demands “Blood and Souls” from his followers), Elric orders the villagers slaughtered in the morning. Again, this is Blondel and Cano’s way of showing us that Elric really is a nasty piece of work, an inhuman member of an alien race with values quite different from ours. But I would contend that if readers do not identify with Elric at least to a reasonable degree, and share in his life dramas and especially his moral dilemmas, we are not reading about Michael Moorcock’s Elric. We are reading about another character altogether. And desperate though he is to find his beloved Cymoril, this slaughter is not the action of the Elric we know from reading Moorcock. Which is why I gave up on this book even before the final scenes. Which, by the way, really let the book down in another important way. It is after all called Stormbringer, after the cursed runesword so central to the narrative. And here the problem is with the artwork, which in places throughout Books 1 and 2 has been truly impressive. In these closing pages, the depiction of the Black Sword itself is poor. This is particularly disappointing after the preview drawings we saw in Volume 1, where Stormbringer looked very different from this version. Not only did it look better, the sword also swelled and got longer as it went into battle—a great visual trick to underline the phallic nature of the cursed blade—one of its powerful metaphorical features in Moorcock’s original. Stormbringer, the sword, is of course a hugely important element in the story of Elric, indeed possibly the key allegory—or bundle of allegories— in the whole saga. How fitting, then, that in this graphic adaptation, it looks decidedly less impressive than it should. This, to paraphrase René Magritte, is La Trahison des Romans Graphiques—the treason not of all graphic novel adaptations in general, but of these two in particular. Et, malheureusement, ceci n’est pas Elric. This entry was posted in Bandes dessinées, Fantasy, Michael Moorcock, Sword and Sorcery and tagged Alan Moore, Arioch, Arthur Conan Doyle, Editions Glenat, Elric Of Melniboné, Faust, Jean-Luc Cano, Jerry Cornelius, Julien Blondel, La Trahison des Images, Michael Moorcock, Rackhir the Red Archer, René Magritte, Robert E. Howard, Robert Fuest, Stormbringer, The Final Programme, The Multiverse, Titan Comics. Bookmark the permalink.